I’d like this morning to look at an icon: it is the icon of the nativity. And I’d like to look at it because it seems to capture so much of the Christmas story. Just a very brief words about icons. They are not meant to be a photograph of the event or person. They are images which are meant to bring out the inner meaning of the event – they show us the event from the perspective of heaven. And they are very stylised, and for those who have not seen this sort of thing before, at first they look very odd to us. 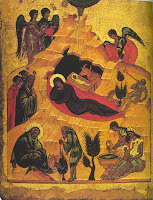 So here it is: the icon of the Nativity – It is 600 years old, and was painted in north Russia, in Novgorod. Far removed from our sentimentalised versions. It is a background wilderness. I did get in big trouble one Christmas time, many years ago, when I described a new born baby as looking like a shrunken Buddha.